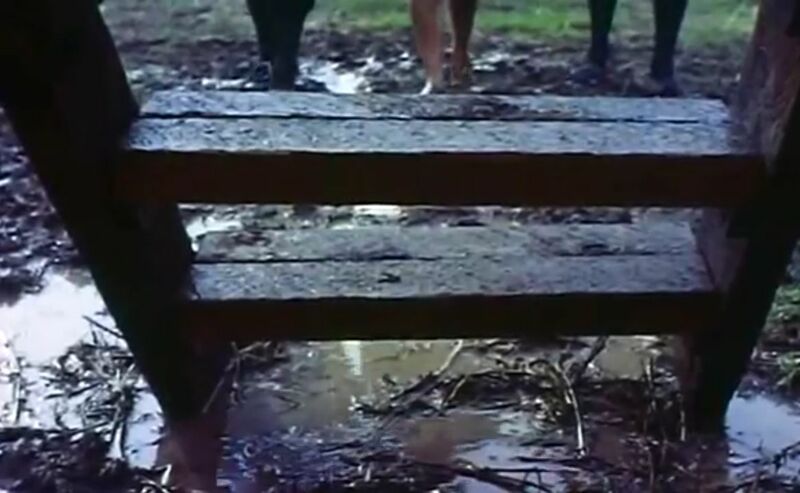 Mark of the Witch (1970) offers another example of how tight framing can hide a low budget. 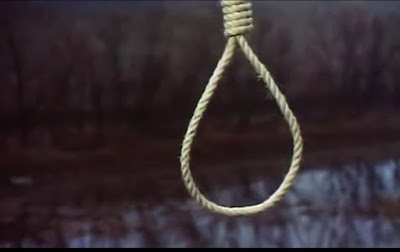 The film's opening shot is of a hangman's noose. Apparently an execution is about to occur. The audience sees the noose and imagine a scaffold. Which is good, because we never actually see a scaffold. With just this one shot of some inexpensive rope, the filmmaker avoids the expense of building a scaffold. 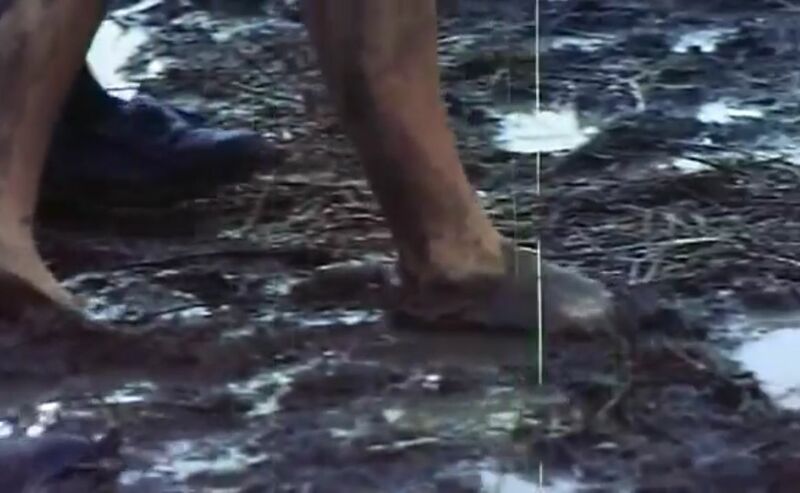 We see three pairs of feet walking in the mud. We can assume the bare feet are those of the condemned witch, approaching the unseen scaffold. The other two pairs are the guards escorting her. We assume the condemned is a witch because of the film's title. We still haven't seen any scaffold or onlookers. But our imagination is filling in those missing elements. Mac Stuart (Robert Elston) watches the procession. A tight shot just of him, from a slightly low angle. Because of this framing, we see nothing around or behind him -- just empty sky. We still don't see any onlookers, which normally would be present at a witch's hanging. The audience must assume and imagine the onlookers. Are they right to do so? We don't hear shouts from the crowd. We can't be sure that Stuart isn't the only onlooker. A note on costuming. Stuart wears 18th century clothes. The Salem witch burnings were in 1692 -- the 17th century. There were no witch's executions in America in the 18th century. So Stuart's costume isn't accurate. I'm guessing it was the cheapest item available that was close enough to a 17th century suit. Low budget filmmakers often cut corners. Many viewers won't notice. Those who do will overlook this anachronism if the film is otherwise entertaining. We see the three pairs of feet approaching the scaffold. Actually, they're only approaching some wooden steps. It might be a simple step ladder. Cheaper than a scaffold, and enough to imply a scaffold. Once again, the audience's imagination fills in the blanks. The witch's feet mount the step ladder -- sorry, scaffold. I didn't mean to break your suspension of disbelief. The hangman and the witch (Marie Santel). Standing on ... what? They could be standing on a scaffold. Or on the ground. Or the sandy shores of a beach. Anywhere, really. The noose could be hanging from a pole, extended by a production assistant. Another note on costuming. The hangman is bare chested. Why? I know films sometimes depict medieval executioners as bare chested. But this hangman lives in colonial America. He wouldn't be bare chested. I'm guessing the filmmaker didn't want to rent a costume for the hangman, and so, rather than have the actor wear his 20th century wardrobe, the director has him bare chested. It's silly but it saves money. And again, viewers savvy enough to notice will forgive -- if the film is otherwise entertaining. The witch addresses the onlookers, beginning her speech with, "You will hear me now, you good men of Lancashire!" So there is a crowd of onlookers. We never see any onlooker other than Mac Stuart. Yet we can assume there's a crowd through two devices: 1. the script, which has the witch addressing many people, and 2. the staging, which has her moving her gaze across an apparently large crowd. A note on sound. There are no crowd noises. Not anywhere in the scene. Okay, so the filmmaker didn't want to spend money on extras. Couldn't he have had his camera crew shout and murmur? Or dub some crowd noise in post production? There is ominous music. But the lack of crowd noises (which should be present) cheapens the scene and hinders our suspension of disbelief. It's not like director Thomas W. Moore doesn't know how to creatively save money on sound. In a later scene, set in 1970, an ambulance collects a corpse in a park, amid cops, reporters, and onlookers. All of the sound -- sirens, reporters reporting the incident, etc. -- was dubbed during post production. It was cheaper to dub those sounds than to hire a sound crew to record on location. A good move that saved money and did not detract from the film. So why couldn't Moore have dubbed some crowd noises for the hanging scene? Also examine the use of low-budget framing in Demon. For more information on framing, costuming, and sound, see Horror Film Aesthetics: Creating the Visual Language of Fear. This blog represents a continuing discussion of my views on horror, picking up from where the book left off. The Blair Witch Project was innovative. I much admire it. But not most of the copycat films that have since tried to mimic its found footage formula. Of course, every successful horror film "inspires" inferior copycats -- and the occasional superior copycat. But the horde of found footage films since Blair Witch have been especially lacking in merit. Is there something unique about the found footage style that encourages bad filmmaking? Yes. The found footage style provides an excuse for -- and thus encourages -- laziness and low effort. In general, filmmakers know that strong production values usually make for a better film. 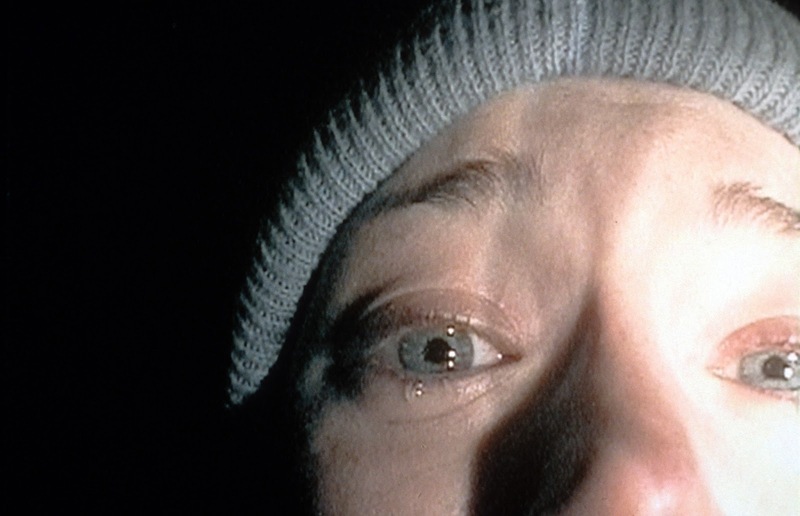 But in the case of found footage, filmmakers often take less care with composition, lighting, or sound, on the rationale that, because the film is supposed to be a "home movie" shot on real-life locations, it makes sense that camera angles are rough. Lighting is murky. Shots are out of focus. Voices are muffled by wind and other noises. Acting and writing also suffer on found footage films. 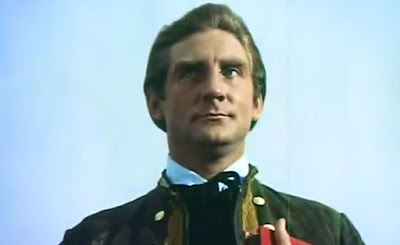 Actors, without talent for improvisation, will nevertheless improvise their dialog (poorly), on the rationale that they should sound like "real people." Well, real people are boring, their dialog a disjointed series of vapid non-sequiturs. Talented screenwriters know that dialog should sound real, but not be real. A script should evoke verisimilitude -- the semblance (not the actuality) of reality. It's not that a found footage horror film can't have great production values, writing, and acting. (The Last Exorcism and Quarantine prove otherwise). It's that the found footage style tempts a filmmaker to slack off. To ignore poor lighting and bad sound recording. To convince himself that his inanely babbling actors reflect a raw authenticity. But rather than capturing an engaging vérité authenticity, the final film often feels lazy, sloppy, and dull. 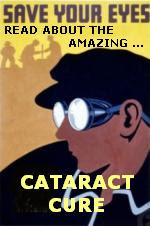 Padded scenes with interchangeable characters, chattering about trivialities while waiting for something to happen. Found footage doesn't mean you can ignore writing, acting, and production values. Audiences still want a strong story told at a fast pace, engaging characters portrayed by talented actors, sharp dialog with witty lines, and all the rest. Not some amateur "actors" wandering about an allegedly haunted ... whatever ... improvising empty dialog, until something evil (that we've already seen in previous films) finally strikes. 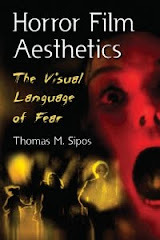 For more information, see Horror Film Aesthetics: Creating the Visual Language of Fear. This blog represents a continuing discussion of my views on horror, picking up from where the book left off.